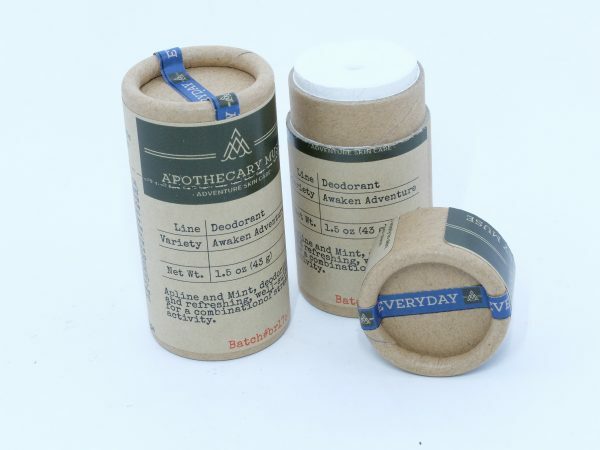 This EVERYDAY blend of Spruce and Grapefruit offer some odor control along with cooling Peppermint which helps to invigorate very active athletes that have a combination of profuse (eccrine gland) and hormonal (apocrine gland) sweat. It also has a touch of Tea Tree and Pine with a witch hazel infusion to encourage moisture and bacteria balance. 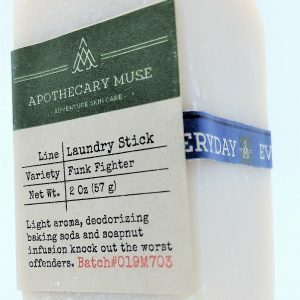 It all blends into its own unique aroma that smells like the High Sierras. 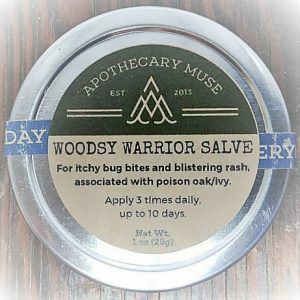 After lots of research and testing on new botanical ingredients, I’ve launched a modification to the base formula which extends the deodorizing performance up to 12 hours! 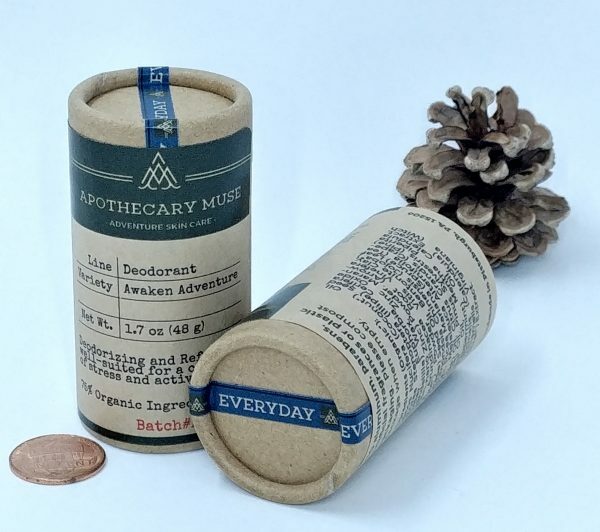 This is one of three aromatherapy blends which include a gentle, plant-based base formulation to meet the changing needs of most people: GENTLE, EVERYDAY and ADVANCED. 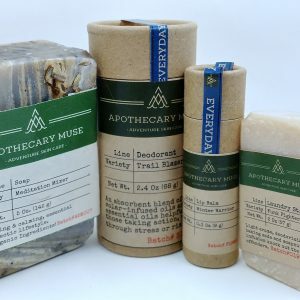 They all have a firm “slip” factor that leaves a light, breathable layer on your skin – where an important lymph node is – while facilitating healthy perspiration. Using antimicrobial coconut oil for the base, non-nano particle zinc, detoxifying bentonite clay, arrowroot powder and the customary essential oil blend (see ingredients) provide antifungal, astringent, antiseptic, antibacterial and deodorizing properties. It may take a day or two to detoxify residue build up from other products – be patient with this transition. Some people also restore their skin’s natural pH with water:apple cider vinegar (1:1) to help this process along. 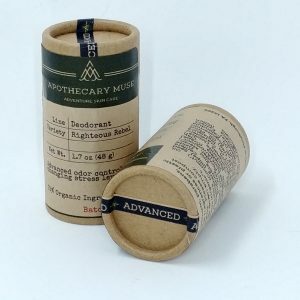 Some people will have to evaluate their expectations based on experiences with commercial deodorants to be more connected with their precise needs; this is not an antiperspirant, although the actions of the pine and clay will support moisture balancing. The primary function of my product is to de-odorize in a breathable base. 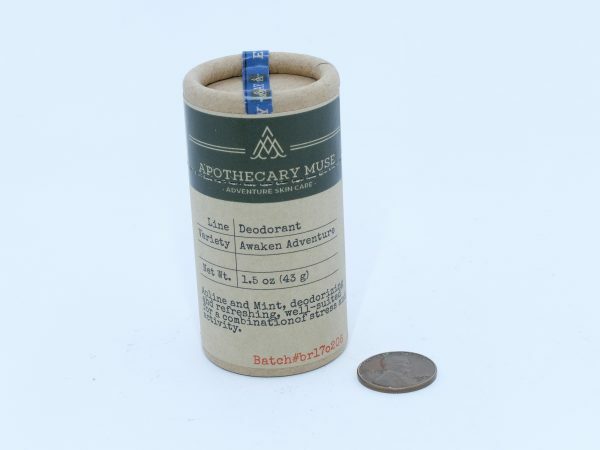 It has NO aluminum, parabens, artificial fragrances or plastic packaging. STORAGE: Keep the surface of the applicator dry and free from other debris and store in a cool and dry (50-80 F). 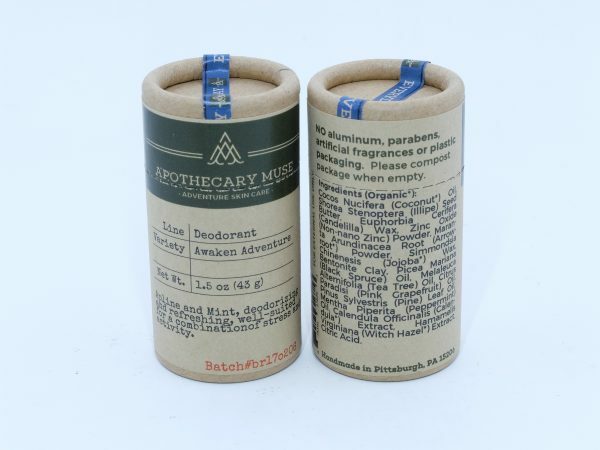 If the product is exposed to extreme temperatures, it may crystallize (develop a slight graininess) which melts upon contact, and you may prefer to warm the tube with your hands for a minute to dispense product – the balanced texture prevents melting or overapplication. 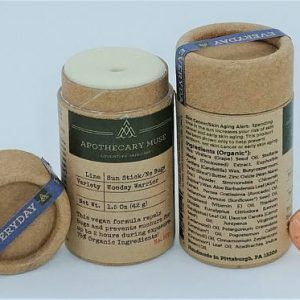 The large paperboard tube has a push-up insert in the bottom and is compostable, so you can throw it in your kitchen scraps pile when you’ve used it all up. 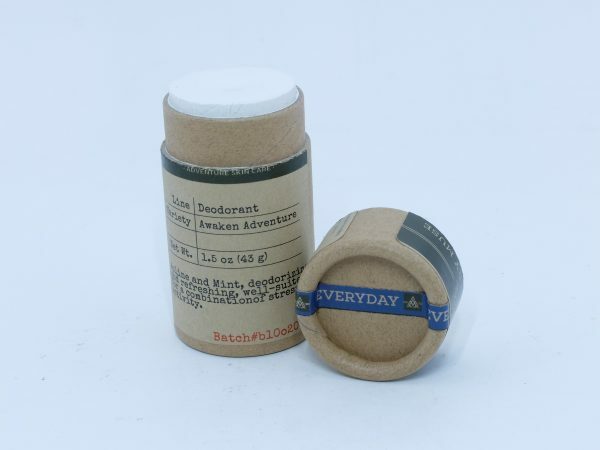 With 1.7 ounces of product, it will last up to 6 months of everyday use for one person. Cocos Nucifera (Coconut*) Oil, Shorea Stenoptera (Illipe) Seed Butter, Euphorbia Cerifera (Candelilla) Wax, Zinc Oxide (Non-nano Zinc) Powder, Maranta Arundinacea Root (Arrowroot*) Powder, Simmondsia Chinenesis (Jojoba*) Wax, Bentonite Clay, Picea Mariana (Black Spruce) Oil, Melaleuca Alternifolia (Tea Tree) Oil, Citrus Paradisi (Pink Grapefruit) Oil, Pinus Sylvestris (Pine) Leaf Oil, Mentha Piperita (Peppermint) Oil, Calendula Officinalis (Calendula*) Extract, Hamamelis Virginiana (Witch Hazel*) Extract, Citric Acid.